A safety device to prevent the dropping of the load in case of breakdown in the balancer and prevent potential injury. The precision guided cable cable is wound in order to avoid entanglement and jamming. The locking device is controlled from the floor for instant clamping and release. Ribbed and sealed monobloc construction in aluminum alloy, optimum safety and sturdiness. Inert spring drum assembly for ease of replacement. Upper suspension with rotary safety hook. Cable guide in anti-frictional material. Taper drum rotating on ball bearings. 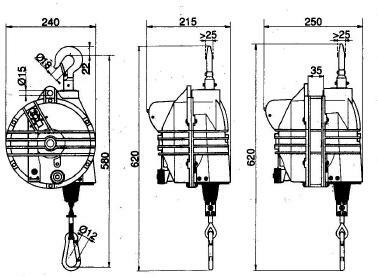 Tension adjustment allows the capacity to be adjusted by means of a worm screw. Electrically insulated suspension system. Lower rotating hook on ball bearing.